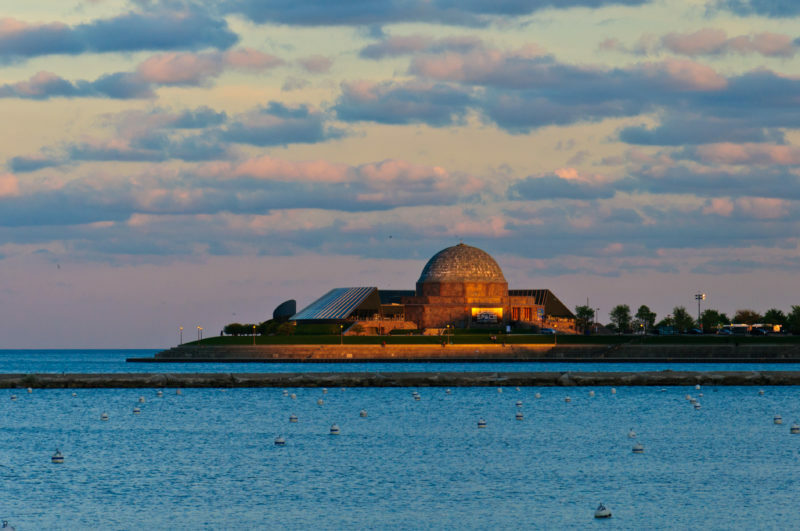 The Adler Planetarium was the first planetarium in the United States. In fact, it was the first planetarium in the entire Western Hemisphere! But, the Adler is much more than a planetarium. It’s also one of the best event venues in Chicago. Offering unparalleled views of the Chicago skyline, the Adler Planetarium is the perfect setting for your next corporate event. On The Scene has experience producing corporate programs at the Adler Planetarium, and our team of expert event managers will work with you every step of the way to create a one-of-a-kind event experience your guests will be talking about for years to come. We become an extension of your team and work as your behind-the-scenes partners, learning your company culture, brand, and event goals to handle everything from the initial planning and logistics to the overall execution the night of the event. Our knowledge of the Adler allows us to make the best recommendations that fit your specific event and helps us to bring your vision to life. From two domed theaters where guests can enjoy a unique sky show unlike any other, to 60,000 square feet of exhibitions attendees can explore, the Adler offers plenty to choose from when planning your next corporate event. You can even book interactive science activities and interactive experiences to offer attendees something different and keep them engaged throughout the entire evening. Turn your corporate program into an evening of exploration, science, space, and creativity at the Adlert! With 16,495 square feet of total meeting space, The Adler Planetarium can accommodate up to 1,200 guests and offers a variety of different event spaces. On The Scene is an award-winning Chicago event management company and Chicago destination management company. As Chicago locals, we are committed to creating unique corporate event experiences in the city we love. When you partner with us on your event, you can rest assured that everything is taken care of – from event planning and event decor, to event transportation, dining, and entertainment. We handle it all! Considering hosting your corporate event at the Adler Planetarium? Contact On The Scene today!